ASTRONOMICAL PHOTOMETRY A Text and Handbook for the Advanced Amateur and Professional Astronomer, Henden and Kaitchuck, 9.5" by 6", 392 pages, hardbound. Photometry, the measurement of light flux, is one of the most fundamental and oldest research techniques employed in astronomy. It is also an area where valuable contributions can be made by amateur astronomers using small telescopes. Most people who do photometry have learned the hard way, because how-to books in this field are very few and often incomplete. 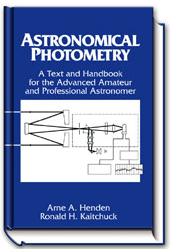 This book is intended to fill this gap for both amateur and professional astronomers who wish to learn the techniques of photoelectric photometry. It begins with an overview of photometry and its history, followed by an explanation of photometric systems and how they are defined. There are three chapters dealing with statistics, required calculations and the processing of the observational data. These chapters, and their related appendices, contain many worked examples to aid the beginner. There are step-by-step instructions on the design and constriction of the photometer head, and two chapters on the associated electronics. The book ends with outlines of some practical observing techniques, suggestions for research projects, and useful appendices of difficult to find information. This book will be an excellent self-contained reference for interested amateur astronomers, astronomy graduate students, or professional astronomers learning photoelectric photometry for the first time. 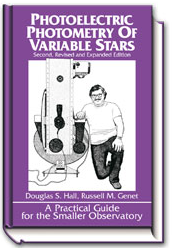 Photoelectric Photometry of Variable Stars, 2nd Edition, A Practical Guide for the Smaller Observatory, edited by Douglas S. Hall and Russell M. Genet. 6" x 9", 240 pages, hardbound. Click the button below to order through Paypal, call Toll-Free, or email. The AAVSO is an international non-profit organization of variable star observers whose mission is to enable anyone, anywhere, to participate in scientific discovery through variable star astronomy. The SSP-3 and SSP-5 photometers are well suited for accurate timings of astronomical events such as lunar and asteroid occultation's. IOTA is the best resource for obtaining information and participating in joint observations of these events. Click here to learn more.